I like bacon. I like oysters. This is a fantastic finger food recipe for the grill, that I've undeniably turned into a main course dinner. Even if you're not a strong fan of oysters, you might find this being pretty tasty. Frankly, the oysters are just a component of the taste, albeit, a weak one. This is a little spicy, but I didn't find it hot at all. Deseed the jalapeno and finely chop. Remove the outer skin and finely chop the shallot as well. Mix all of the salsa ingredients into a small bowl and mix up well with a spoon. If you're making this ahead of time, cover and stick in the refrigerator. Soak some wooden skewers in water for about 15 minutes. Lay out some normal bacon strips on a cutting board and cut them in half, ending up with about 4 inch strips. 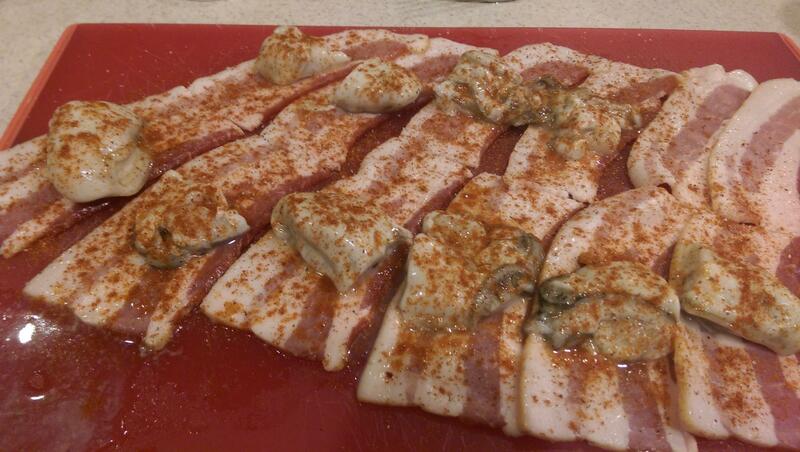 Lay the oysters out in the middle of the bacon strips. You can either buy already deshelled oysters or deshell them yourself. In any event, if the oysters are really large, you might consider cutting them in half so these guys stay bite size. With the oysters laid out on the bacon sprinkle the paprika, cayenne, salt, and pepper on them. 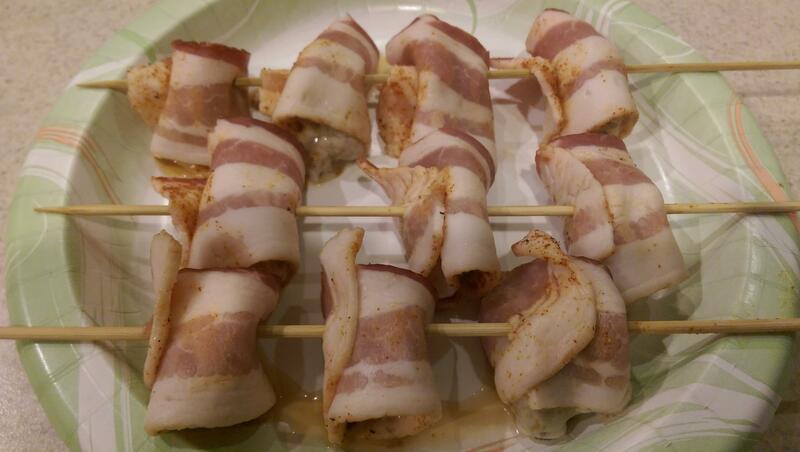 Then, roll up the bacon and poke the skewers through. I fit 3 to 4 oysters per skewer. Then, stick the skewers on the grill at medium heat. You're not looking for super crisp bacon here, but fairly well done. It usually runs about 5 minutes per side with a couple flips. Watch the flames, you don't want to burn these. 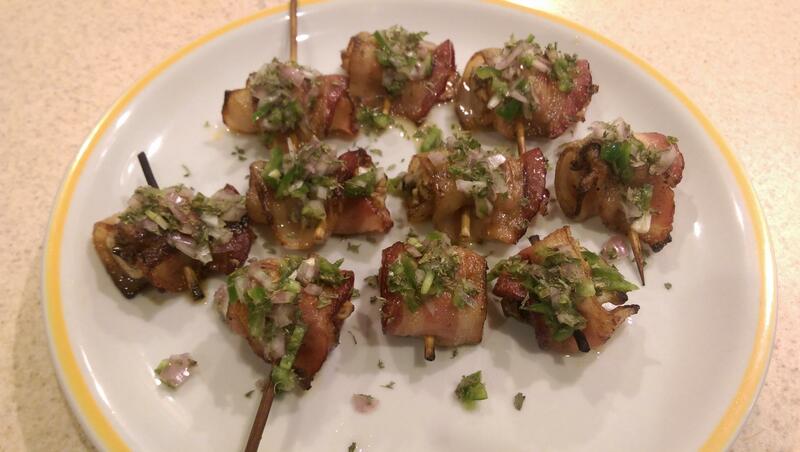 Take the skewers off the grill and cut them into individual toothpick-like edibles with some strong shears. Spoon out a teaspoon of the salsa onto the top of each of the oysters, sprinkle a little bit of chopped parsley for accent, and serve immediately. These are guaranteed to go fast.